Córdoba — You might consider Córdoba’s drinking scene to be dedicated to hops and Fernet but there’s a bijou winemaking scene here, with around 15 wineries dotted around the province. Winemaker Matías Micheline at La Matilde. Traslasierra, a valley behind the mountains and south of the provincial capital, is where Córdoba winemaking is at with the likes of Finca Las Breas and Bodega San Javier leading the pack. And, one project to keep an eye on is Comarca La Matilde in San Javier. Not only is this an organic and biodynamic enterprise, of which there are relatively few certified in Argentina (Mendoza’s Alpamanta and Costaflores are led by foreigners from Austria and the US respectively), but top winemaker Matías Michelini from Passionate Wines in Gualtallary has had his interest piqued; he is now overseeing La Matilde’s four hectares of vineyards. The three-strong team behind La Matilde, located at the base of Mount Champaquí at 800 metres above sea level, planted Tannat, Malbec and Cabernet Sauvignon seven years ago but after undertaking rootstock grafts that set the team back a couple of years, the farm finally released its first Tannat, Sierra Roja, in 2016. A coincidental meeting with Matías got him on board, says co-owner Pablo Asef, one of the group of childhood friends who kickstarted La Matilde alongside Raúl Mare and Luis Varela. Following a comedy of identity errors, Pablo finally met Matías, thinking he was a different winemaker but no harm was done; Matías put that initial exuberant greeting down to Córdobes friendliness and the deal was sealed regardless. Involved for the past 12 months, the top winemaker clearly sees potential in these rocky hills and is particularly keen on producing Tannat in Córdoba, so much so he is looking to plant additional vines next spring. Talking about the 2017 vintage, Matías says: “It was an incredible experience because it’s the very first time La Matilde harvested its own biodynamic grapes for its very own winery (in 2016 they made wine at nearby Las Breas). 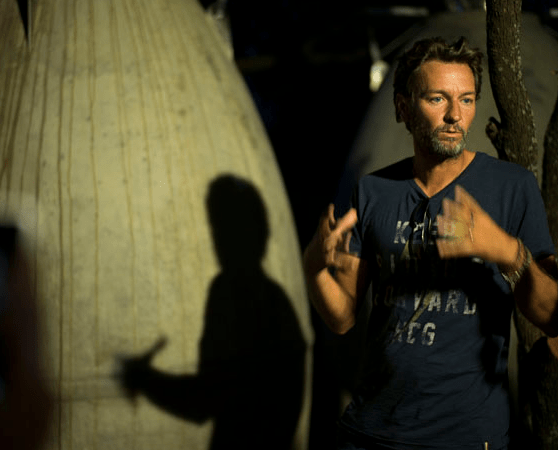 “It’s special because the winery is located outdoors and comprises five concrete eggs and now we we have our own space to make wine, we can ensure the bodega, as well as the grapes, becomes certified as biodynamic. La Matilde, however, is an ambitious sustainable project that doesn’t just touch on wine. The complete package includes a stunning sustainably constructed, (and beautifully decorated in the most elegant of rustic elegance, I might add) 10-room lodge; a herd of Swiss Saanen goats (that receive homeopathy treatments should they fall sick) producing organic milk for a delectable range of cheese, including camembert under Las Tres Tejas label; a vast and hard-working orchard that’s home to olive groves, quinoa, herbs, chili peppers, cabbages and all kinds of fruits and vegetables; and a pulpería (rural store) whose staff harvest in accordance with the biodynamic calendar and sell the freshest of wares every day of the week. This is a whole ecological deal — and should you wish to subscribe to this lifestyle, you can snap up a plot of land and build your own biodynamic home. As for Sierra Roja Tannat 2016, it’s a noble first attempt that’s already been awarded 91 points by one Argentine wine critic. At first nose — and despite the appearance of plenty of dark fruit — not much gives it away as being Tannat; the mouth is bright and spiced, although the finish is shorter than I’d hope. Tannins are rounded, and not overly intense, good news because Uruguayan Tannats can be unbearably harsh. Sierra Roja isn’t mind-blowing but it’s certainly a jolly and friendly wine that went down a treat with oven-roasted kid (straight from the farm). I’ll looking forward to samply the 2017 once it’s undergone some Michelini magic teamed with La Matilde love and passion. 950 pesos.